While replete with horror film genre conventions—a monstrous antagonist; teenagers caught in an old, dark scary house; a menacing pit bull; and the like—my interest in Don’t Breathe, Fede Alvarez’ new home invasion thriller lies in its representation of the collapsed modern American city. The plot concerns Rocky (Jane Levy), foolishly in love with Money, a small time hood. They have befriended Alex, the kind middle-class son of a security guard, so that he can steal his father’s alarm codes in order to rob houses. Rocky is able to convince Alex to help them with one last crime because he is deeply in love with her. The teenagers have selected the home of Norman Nordstrom (Stephen Lang), a veteran blinded in the Iraq War, because he is sitting on $300,000, a legal payout for the murder of his daughter by a drunk driver. In casing Norman’s suburban neighborhood, Alex observes that this “part of the city is a ghost town,” alluding to the economic collapse of Detroit. As manufacturing jobs disappeared, the rich white suburban counties disentangled themselves from the largely Black inner city, vacating the space in-between, formerly inhabited by a thriving middle-class which no longer exists. This no man’s land, now inhabited only by a crazed, blind veteran, is the source of Alvarez’ film’s considerable horror. Yet only a few exterior shots were actually filmed in Detroit. Because it is much cheaper to shoot in Hungary, Alvarez developed his low budget thriller as a runaway production. However, Don’t Breathe defies the tradition of other recent horror films in which Americans get terrorized by brutal Europeans, for example, Hostel (Eli Roth, 2005). 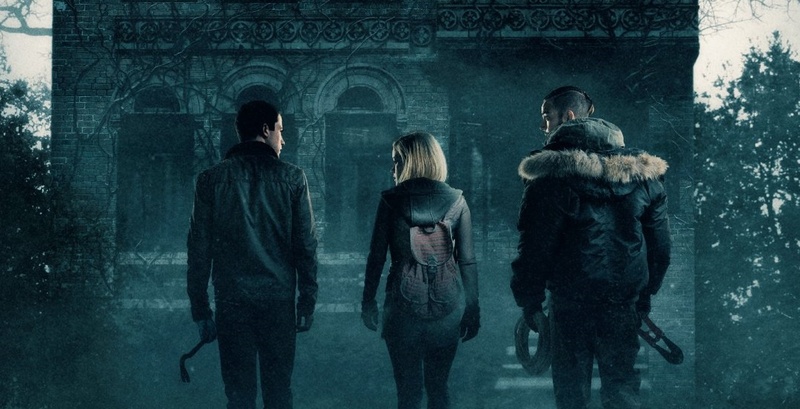 Instead, Don’t Breathe doubles down on its hopeless representation of the contemporary American city: Detroit is so bad that we easily imagine that it is Eastern Europe as destroyed by the disastrous economic policies of the Soviet Union. The geography of Don’t Breathe recapitulates the history of horror. In Classical Hollywood Cinema, horror was distinctly European: the 1930s films made at Universal Studios pretended that Los Angeles soundstages were in fact remote Eastern European castles and forests. Frankenstein (1931) and Dracula (1931) assume that the monstrous emerges from a morally corrupt Europe. With Psycho (Alfred Hitchcock, 1960), American horror was revealed to lie in our very homes, not in some foggy village across the Atlantic. Marion (Janet Leigh) steals $40,000 from her boss so that she can escape the City of Phoenix with her adulterous boyfriend, Sam (John Gavin). Upon stopping at the Bates Motel, she is murdered by Norman (Anthony Perkins), the all-American boy next door, at precisely the moment she decides to give the money back. Rocky has a similar choice toward the end of Don’t Breathe. She cannot call the police and still keep the money she has stolen from this new, even worse Norman. If she wants her freedom, she has to abandon her friends. If she wants to save lives, she has to leave behind the money. Unlike Marion in Psycho, Rocky makes the immoral decision, opting for the cash. She does this for reasons that have nothing to do with the horror film: she needs the money to rescue her young sister, Diddy from her abusive mother and her even worse boyfriend, both intriguingly played by Hungarian actors. Rocky plans to take Diddy to California, to start a new life, the story of European immigrants to America since the 19th century. Once freed of its horror film moorings, Don’t Breathe emerges in a completely different generic light. In its representation of a decayed, dysfunctional Detroit, Alvarez’s film shares the most with 8 Mile (2002), a backstage musical directed by Curtis Hanson and starring white rap singer, Eminem. The film’s melodramatic spine, the desires which motivate the characters, is identical to that of Don’t Breathe. Rabbit (Eminem) desperately dreams of rescuing his young sister, Lily from his dysfunctional mother, Stephanie (Kim Basinger) and her ne’er-do-well boyfriend, Greg (Michael Shannon). They live on 8 Mile Road, the iconic geographical boundary in Detroit between the inner city and the white suburbs. The divergent resolutions of the two films emphasize the increasingly hopeless decay of the American city. In 2002, there was still the possibility that Rabbit could fix his life. He wins his rap battle at the end of the film (by exposing his African-American nemesis as a poser, because he attended a wealthy prep school in the suburbs). Stephanie sobers up, and Rabbit’s family is preserved. While 8 Mile ends in ambiguity—Rabbit turns down the job he is offered hosting more rap battles, so that he can find success on his own terms—the film leaves its characters in better shape than it found them. Don’t Breathe, on the other hand, like Hamlet, leaves most of its characters splattered dead in Norman’s house. By refusing Marion’s ironic punishment in Psycho, Rocky leaves Detroit with the money and her sister. However, the film teases a sequel in which the never-quite-dead monster from contemporary horror films will hunt her down. In geographical terms, unlike Eminem in 8 Mile, Rocky can never escape the horror that is Detroit: in the guise of Norman Nordstrom, someone akin to the blind seer Tiresias in Oedipus Rex (who can dole out apocalypse with his all-seeing knowledge), Detroit will hunt her down in perpetuity. 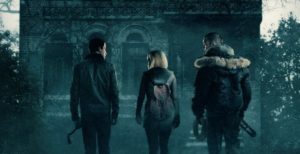 Don’t Breathe is a terrific horror film, scary and disturbing; as a meditation on the failed American city, it is a masterpiece.